So, at the farmer’s market I couldn’t resist buying 3 different varieties of pumpkin(cheese pumpkin, sugar pie, and red kuri(first one pictured below). I wanted to roast them and freeze the puree for later use, and also do a side by side taste test. Enlisting JF’s help, we set to work. So, first cut the pumpkin in half and using a spoon, scrape out the seeds and stringy bits into a bowl. I then did cut into fourths so I could fit them better in the pans, but you could leave it in half too. Now, this time I put them cut side down but I think last time I did cut side up and covered with foil. I think I prefer cut side up, but you can do either way. Make sure you have a bit of water in the pan, or use foil lining if you do cut side down. Roast in the oven on 400 for 45 mins or until its completely soft when you jab a knife or fork into it through the skin. Remove and let it sit to cool off for a while. Then you should be able to peel the skin right off, but if not, use a spoon to scrape out the flesh(doesnt “flesh” sound gory?). Mash by hand, with a fork or in a food processor. So what are the results? The red kuri is the winner. It had a deeper pumpkin taste and a smooth consistency. In second place was the cheese pumpkin. This one was actually sweeter than the red kuri, but its flavor was not as strong and most importantly, it was VERY VERY watery. I was literally squeezing its “juice” out of it! I did not have to squeeze the other pumpkins at all. But from this one, I got a whole jar of liquid without even straining it. Weird. That jar is pictured above. I won’t waste it either, I can use it in making chapathi/bread dough, soups, etc. And in last place is the sugar pie. I don’t know if I just picked a bad/unripe one or what. It was rather tasteless and quite stringy, though I have had luck with them in the past. Not featured here, but if you get a chance, grab a blue hubbard squash. Love those. Don’t throw away the seeds! To me, that was the best part. Pick the big clumps of stringy bits off, but don’t rinse them. I think the flavor is so much better this way. Drizzle a little olive oil over them, stir, add salt and red chili powder (or cajun seasoning) and stir again so they all get coated. Don’t go too heavy on the salt. Spread on a baking sheet and bake for 20-30 mins at 300, or until crisp, but not too brown. Don't toss the seeds, roast them! Again we did a comparison. The large ones(seen in the gallery pic) are from the red kuri and they remained kind of tough (maybe I didn’t bake them long enough?). 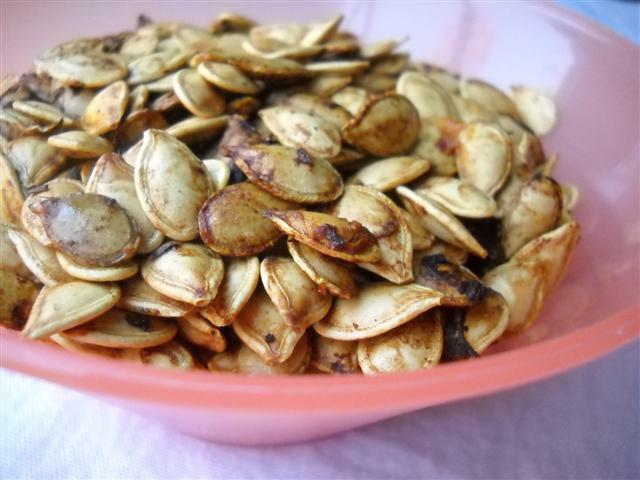 It was a tie between the sugar pie seeds (JF’s vote) and the cheese pumpkin seeds (my vote). They are both good. In fact, they are addictive!